Video copyright Namale - The Fiji Islands Resort. Perched majestically on volcanic uplifts with breathtaking views of the Koro Sea; the jewel that is Namale, is Fiji's only luxury boutique 5 star resort offering fully all inclusive rates with no limitations on food and beverage. For the more discerning guests that appreciates understated luxury and demands this while on holiday, Namale offers 19 well appointed and luxuriously furnished bures and villas spread out over 525 acres of virgin rainforests, a golf course, a private waterfall and so much more. 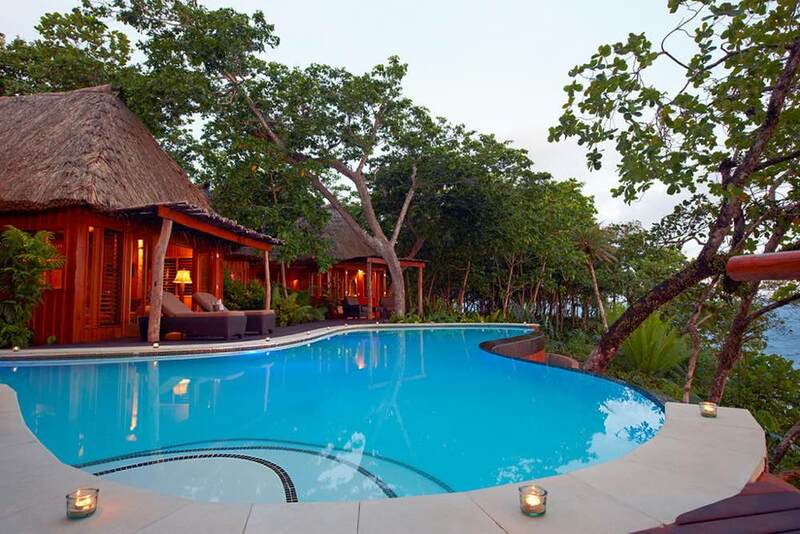 The #1 spa in Fiji and the South Pacific can also be found at Namale. Offering many points of differences over other 5 star resorts in Fiji and the South Pacific, Namale is more than just a journey to Paradise, It's an experience in itself that you least expect yet will never forget. Namale Resort & Spa was created with your desires in mind. Your desire for seclusion, for splendor, for authenticity, for an out-of-this-world experience tailored to your every whim. We like to think of our emerald haven as the escape from the everyday escape. Here, the all-inclusive experience is elevated to a luxurious, highly individualized art form. Our staff of 140 (about three staffers for every one guest) ensures your experience is a seamless one, from the private three-course lunches and five-course dinners—taken anywhere you like, on your sundeck, on the beach, inside a cave—to the gorgeous appointments of your very own Fijian bure or villa overlooking the Koro Sea. Don't settle for anywhere short of unforgettable. When you join us inside this hidden world of bliss and adventure, your everyday concerns are traded for lasting rejuvenation. A trip to Namale will live with you forever. Pros: From the moment you arrive, the festivities begin with a warm and welcome song by a half dozen of the staff enthusiastically greeting you. While checking in at their open air lobby with fruit drinks and cool towels the Manager reviews any requests, special needs, celebrations while with them for the week. You are then whisked away to your bure in one of the golf carts where a bottle of champagne on ice is awaiting you. The friendly Fijian driver will point out the Kava Bowl consisting of a bowling alley, bar, game room, virtual golf simulator. He will direct you to the Marine Center if you are interested in scuba, snorkeling, stand up paddle boards, fishing just to name a few activities. Of course the horses are nearby if you'd like to organize a horse ride along the beach. While at Namale the guests feel embraced and cared for yet left alone to discover all of amenities and activities Namale has to offer. Every meal is a celebration of gourmet delights. There are several selections from which to choose which change on a daily basis. Plan on enjoying a 3 course lunch and 5 course dinner. You also have the option to dine in your bure, at a nearby waterfall, or in a cave just to name a few ideas. Most guests gather around 6pm in the main bure for cocktails and to mingle with other travelers from around the world. Dinner begins at 7pm. At least 1 visit to the award winning Namale Spa is not to be missed. Scheduling a massage is not your ordinary activity where you walk into a room and someone rubs you for an hour. It begins with several oceanfront soaking tubs filled with lavender, mint, all sorts of tropical herbal combinations to relax you. While laying in your tub of lavender and mint, enjoy a tropical drink and perhaps a snack of prawns and chips. There is also a waterfall massage area, sauna, ice pool and soaking tub. The spa is perched on a cliff overlooking the ocean below. .
Cons: There are very few negative factors to list about Namale Resort. I suppose if your dream is to have a huge white sand beach where you can walk for miles, Namale does not have it. Their beaches are smaller, more coral and rocks but that also means incredible sea life for snorkeling and scuba diving. Travel in Feb and March will be very hot and humid so you may want to avoid those months although Namale does offer air conditioning and plenty of indoor activities like their bowling alley, simulated golf center (with bar) and largest spa in Fiji. Pros: Namale Resort is the "essence of romance". The bures (villas) are spaced far apart for privacy. I will be visiting Namale in just a few days and will update you!